So the Pandigital Novel that I ordered from Kohl’s arrived earlier today and I’ve been testing it out all afternoon. The first thing I did was install the latest firmware from Pandigital’s website because they are still in the process of refining it. The Pandigital Novel reminds me a lot of the Barnes and Noble Nook. 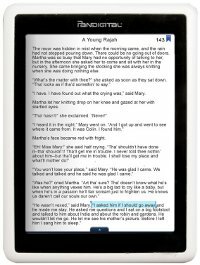 When the Nook was first released there was a big uproar about how slow and laggy it was, how the touchscreen didn’t work properly, how there was so many bugs they were crawling out of the casing, how it was a complete disaster, in short. But after B&N started releasing firmware updates to address the issues, things began to improve quite a lot. In fact, I recently noticed that the Nook has a rating of 4.5 stars over 60 reviews on Best Buy.com—higher than I would expect, but then again the Nook didn’t come to Best Buy until after the updates improved the Nook’s functionality. So where am I going with this, you ask? Well, Pandigital is in the same boat: They released their device well before the firmware was ready for prime time. The touchscreen’s responsiveness is downright hair-pullingly frustrating, no matter how many times I calibrate the screen. I finally started to use the eraser end of a pencil for tapping to make selections and that actually worked fairly well, except it keeps getting eraser crud all over the screen. Page-turns? Nope. Sometimes they’ll work and other times not, eraser or no eraser. And page-turns take longer than E Ink, somehow. And then, once in a while, it seems to work okay. Things are moving along smoothly, the screen is reacting to touch . . . and then you get into a menu with no way out because there is no back button or the the back button won’t work no matter how many times you jab it with an eraser or finger tip or gun barrel. The only way to get out is to hold the power slide for 5 seconds and then re-boot it, which takes a good 60 seconds. I honestly don’t think there was very much time put into initial testing of this product’s firmware. Patience is required. Once Pandigital gets the firmware in check, the Novel has some potential at being a decent budget ereader or basic tablet. It’s all up to the firmware department. Update: I’ve since graduated from the eraser and started using a hard-tipped stylus. The stylus works really well, even turning pages and scrolling (somewhat). Perhaps they should have considered including one . . .
To get Wi-Fi working I just had to let it scan for the router and then enter the password. Sometimes it connects fine and other times it keeps scanning and won’t connect. The basic browser works fairly well, if somewhat slower. But scrolling is damn near impossible in its current touchscreen-impaired state, not to mention typing on the keyboard. No Flash support either, of course. The browser works in portrait mode by default—to skinny—so I found the option in the settings menu of the browser to switch to landscape mode, which is much better. One cool thing, I went to Project Gutenberg and tried to download an EPUB ebook. Good news was that it worked. Bad news is the only way to get out of the download page is to shut down the device and re-boot it again. Patience. When it gets back to the menu the book is in the library, ready to read. The problem is there’s very little settings in the reader. No options for font type, no brightness setting, and the white of the screen sparkles like fresh snow on a sunny morning. The options is does have are highlighting, adding notes, changing the font size, dictionary, night mode (white text on black background), search, bookmark, and jump to page. Okay. So get this. With the exception of a small menu at the top of the homepage, ebook browsing is done with the browser on B&N’s main site, not in a built-in store or an app. And the main site isn’t exactly optimized for a 7-inch screen. In the device’s ebook library list there’s an icon that says “get ebooks”. Clicking on it brings up a prompt to sign in to Barnes and Noble. Once done, it brings up your list of ebooks on account at B&N. From here you can download them. I tried several. The download bar comes up but they never download. I tried downloading a sample of an ebook and that worked. Go figure. I transferred several of my B&N ebooks onto an SD card and they show up on the Novel. When clicked they bring up a prompt to enter your name and cc number for B&N’s account. But I couldn’t get it to work. I even verified everything using my computer and it simply will not authorize on the Novel. And that’s where this initial review ends and the updated Pandigital Novel review begins.